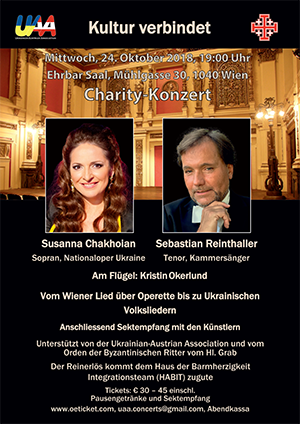 Austrian-Ukrainian Association, in partnership with the Order of the Holy Sepulchre, has the pleasure to invite you to a Vienna-concert of the Ukrainian opera star, soprano and soloist of National Opera Ukraine, Susanna Chakhoian. Together with her partner, the well-known and popular opera- and operetta-tenor, Kammersaenger Sebastian Reinthaller, they will perform Vienna songs, operetta arias and Ukrainian traditionals. At the grand piano: Kristin Okerlund (Vienna State Opera). Enjoy a glass of champagne during a Meet & Greet with the artists after the concert. Tickets: from EUR 30 - 45 including all beverages via oeticket.com, or at the box office prior to the concert. Net proceeds of this charity event at the historic and splendid Ehrbar Saal will be donated to Haus der Barmherzigkeit Integrationsteam (HABIT) for elderly and disabled people in bare need.